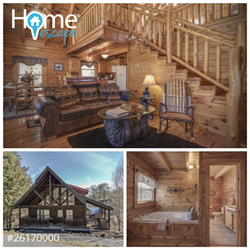 The Smoky Mountain region, with its impressive array of vacation home rentals, is quickly becoming the go-to holiday destination for families looking for a break according to HomeEscape. More and more travelers are choosing to have an adventurous Thanksgiving trip with their family. The Smoky Mountain region, with its impressive array of vacation home rentals, is quickly becoming the go-to holiday destination for families looking for a break. 1. The Great Smoky Thanksgiving Arts & Crafts Show. After a delicious Thanksgiving meal, visitors can get out for some holiday shopping. The Great Smoky Thanksgiving Arts & Crafts Show, scheduled for November 21 through November 26, 2017, is the perfect place to pick up a unique treasure for your loved ones. All of the crafts for sale at the event, located at the Gatlinburg Convention Center, are made by members of Great Smoky Arts & Crafts Community. For those that can’t wait to get out on the slope, Ober Gatlinburg is the prime Gatlinburg attraction to visit. Visitors can drive to the top of Mt. Harrison or take the aerial tramway to access Ober Gatlinburg Resort. The tramway departs every twenty minutes from downtown Gatlinburg. Families can enjoy the sweeping views of the mountains as well as downtown Gatlinburg. Although families will be focused on Thanksgiving, Dollywood is already preparing for winter excitement with their Smoky Mountain Christmas festival. From November 4 to January 1, 2018, Dollywood shines with four million Christmas show, and exciting year-round rides. It’s the perfect family activity for the holidays – located in nearby Pigeon Forge. From hiking trails to auto tours, discovering the Great Smoky Mountains National Park is one of the best things to do in Gatlinburg during Thanksgiving. This National Park has views for miles, and is consistently enjoyed amongst visitors. Additionally, the park is a great way to exercise-off any excess pounds from a large Thanksgiving dinner. Enjoy the great outdoors with family-friendly ziplines. With 7 ziplines up to 2,500 feet long located in the heart of Sevierville just minutes from Gatlinburg and Pigeon Forge. For one of the best Thanksgiving meals in Aspen, look no further than the Old Mill Restaurant. An old-fashioned family feat is served at The Old Mill Restaurant. Unfortunately, they don’t take reservations, so families will have to be content with exploring Old Mill Square untile a space opens up. Why not start your Thanksgiving day with a stack of jacks? Visitors can sneak out of the house to eat the best pancakes of their life (anytime between 7:00am to 2:00pm). Pancake toppings range from sweet syrup to coconut at one of Gatlinburg’s most popular pancake houses. On Thanksgiving Day, Smoky Mountain Brewery opens their doors from 11:00 am to 11:00 pm. For craft beer lovers, this is a great option. Featuring six flagship beers, four rotational brews, and other great options, Smoky Mountain Brewery offers a great selection of beers for the Thanksgiving Holiday. Dine at Pigeon Forge’s finest – Big Daddy’s Pizzeria. With gourmet ingredients and hand-crafted dough, families can enjoy delicious pizza while the kids play at the arcade. Too good to be true? Not at Big Daddy’s. HomeEscape has a unique collection of vacation rentals near the Smoky Mountains. Families can find an affordable Pigeon Forge cabin rental, a spacious Gatlinburg vacation rental or a cozy Sevierville cabin rental for their Thanksgiving vacation. HomeEscape has thousands of vacation rentals in Tennessee and worldwide without booking fees or processing fees.